So in honor of Dr. Light (and in order to familiarize some of my readers with his work), I’m posting a long piece he shared with his Facebook fans a few days ago. I’ve highlighted a few points here. 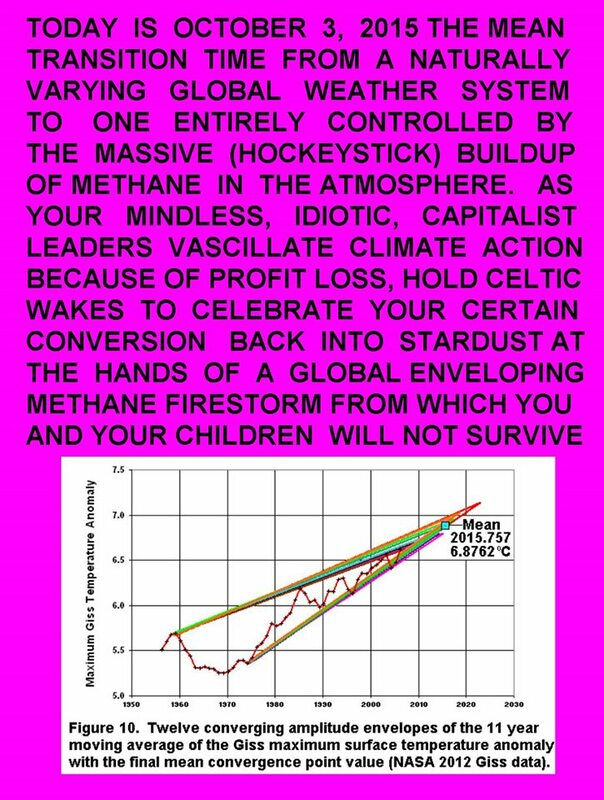 As you know the weather is starting to change rapidly for the worse now and I have been working on Arctic methane induced global warming for about 14 years. There are massive deposits of methane gas trapped in the undersea permafrosts in Russian waters and onland in Siberia as well and if the global warming boils of just 10% of what is there, there is enough to cause a Permian style extinction event that humanity will not survive. Some brilliant work on the Arctic methane threat has been done by a Russian scientist Natalia Shakova and others who indicate that we are in a very perilous position, if we don’t find a way of reducing the atmospheric methane and depressurizing the undersea methane to stop the massive methane eruptions there. I and some other workers have designed a radio – laser Atmospheric methane destruction system based on the early Russian radio – wave induced conversion of methane to nano-diamonds. This radio – laser system can be installed on nuclear powered boats such as the 40 Russian Arctic ice breakers and start immediate work on destroying the atmospheric methane clouds that are building up in the Arctic. An abstract about the system is attached and it has been accepted for presentation at a congress of the American Meteorological Society to be held on January 10 – 14, 2016 at New Orleans in Louisiana, U.S.A. This system should be mounted on the nuclear icebreakers and used onshore. Once the methane is brought under control there should be a reduction in the massive fire hazards, heat waves and severe storms systems that are plaguing Russia and the rest of the world. Methane formed by organisms in the water becomes trapped in the fabric of water ice crystals when it freezes and is stable below about 300 metres depth in the Arctic Ocean and on the shallow East Siberian Arctic Shelf. There are such massive methane reserves below the Arctic Ocean floor, that they represent 100 times the amount, that is required to cause a Permian style major extinction event, should the subsea Arctic methane be released into the atmosphere because of methane’s giant global warming potential (100 to 1000 times CO2) over a short time period (Light and Solana, 2012 – 2014, Carana 2012 – 2014). There are also giant reservoirs of mantle methane, originally sealed in by shallow methane hydrate plugs in fractures cutting the Arctic seafloor and onshore in N. Siberia (Light, 2014, Carana 2013, Light, Hensel and Carana, 2015). 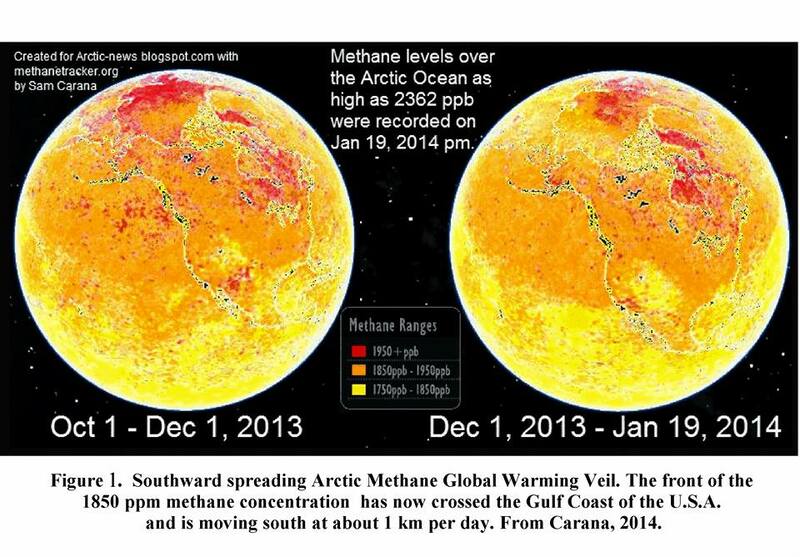 The whole northern hemisphere is now covered by a thickening atmospheric methane global warming veil from Arctic methane emissions at the level of the jet streams, which is spreading southwards at about 1 km a day and already totally envelopes the United States (Figure 1). There must therefore be a world – wide effort to capture and thus depressurise the methane in the subsea and surface Arctic permafrost and eradicate the quantities accumulating in the ocean and atmosphere. Methane produced at the surface diffuses upward and is broken down by photo dissociation (sunlight) and chemical attack by nascent oxygen and hydroxyl (Heicklen, 1967). The Lucy Project is a radio/laser system for destroying the first hydrogen bond in atmospheric methane when it forms dangerously thick global warming clouds over the Arctic (Figure 2, Light & Carana, 2012). It generates similar gas products to those normally produced by the natural destruction of methane in the atmosphere over some 15 to 20 years. Radio frequencies are used in generating nano – diamonds from methane gas in commercial applications over the entire pressure range of the atmosphere up to 50 km altitude (Figure 2, Light and Carana, 2012). Recent experiments have shown that when a test tube of seawater was illuminated by a polarized 13.56 MHZ radio beam, that flammable gases (nascent hydrogen and hydroxyls) were released at the top of the tube (iopscience.iop.org, 2013). In the Arctic Ocean, polarized 13.56 MHZ radio waves will decompose atmospheric humidity, mist, fog, ocean spray and the surface of the waves themselves into nascent hydrogen and hydroxyl over the region where a massive methane torch (plume) is entering the atmosphere, so that the additional hydroxyl produced will react with the rising methane, breaking a large part of it down (Figure 2)(iopscience.iop.org, 2013). A better system could use Nd: glass heating lasers containing hexagonal neodymium which is stable below 863oC (Krupke 1986 in Lide and Frederickse, 1995). Neodymium glass lasers have extreme output parameters with peak powers near 10 to the power 14 watts when collimated and peak power densities of 10 to the power 18 watts per square cm if focused (Krupke 1986 in Lide and Frederickse, 1995). Velard (2006) states that at the Lawrence Livermore Laboratory, for inertial confinement nuclear fusion, “192 beams of Nd: glass – plate amplifier chains are being used in parallel clusters to generate very high energy (10 kilojoules) at a very high power (>10 power 12 watts) and at the second and third harmonics of the fundamental, with flexible pulse shapes and with sophisticated spectral and spacial on – target laser light qualities”. The Nd: glass laser system is more stable and efficient than the longer wavelength CO lasers and shorter wavelength KrF lasers (Velard, 2006). The three 13.56 MHZ radio transmitters in the Lucy Project (Figure 2) could be replaced by 3 groups of parallel lasers each forming a giant circular flash lamp. Half the Nd: glass lasers in the flash lamp could be tuned to exactly 21 million times the 13.56 MHZ methane destruction/nano – diamond formation frequency (Mitura, 1976). The adjacent alternate lasers will be tuned to a slightly different frequency exactly out of phase with the primary frequency by 13.56 MHZ.The Nd: glass lasers have a wavelength of 1052 nm equivalent to a frequency of 2.85*10 power 8 MHZ. The methane molecule requires 435 kilo – joules per mole to dislodge the first hydrogen proton and an average of 409.3 kilo – joules per mole for the other three protons (Hutchinson, 2014). Hydroxyl requires 493 kilo – joules per mole to generate it from water (Hutchinson, 2014). A set of four focused Nd; glass lasers will have an energy of about 454.5 kilo – joules per mole, and will be strong enough to dislodge the first hydrogen proton from a methane molecule. Of course this can also be achieved by increasing the number of focused lasers to six or eight. Exactly the same neodymium laser system could be shone on the sea surface, at the base of the rising methane cloud, generating hydroxyls and nascent oxygen and thus breaking down the methane. The power source for these radio transmitters/lasers in the Arctic can come from floating or coastal nuclear or gas electric power stations and the transmitters could be located on shore or on boats, submarines, oil – rigs and aircraft. We have only 1 to 5 years to get an efficient methane destruction radio – laser system designed, tested and installed (Lucy and Alamo (HAARP) projects) before the accelerating methane eruptions take us into uncontrollable runaway global warming. Humanity will then be looking at catastrophic storm systems, a fast rate of sea level rise and coastal zone flooding with its disastrous effects on world populations and global stability.